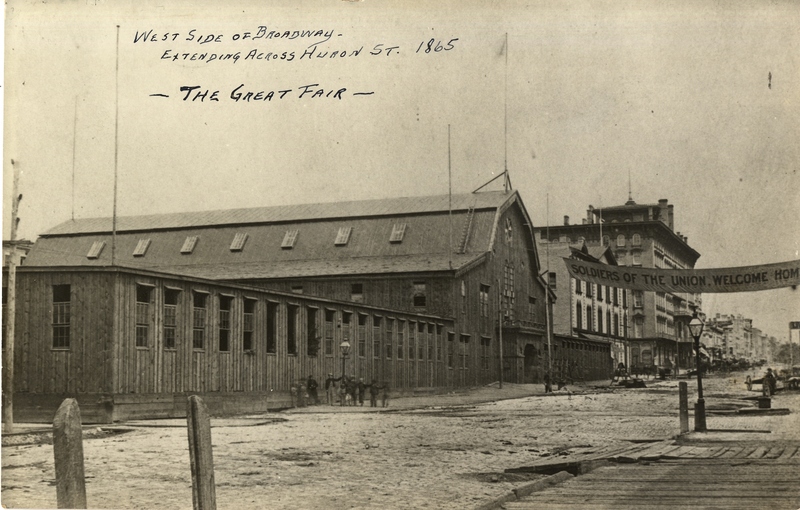 Milwaukee was buzzing with activity in late June and July of 1865, as the month-long fair to raise money for the local soldiers’ home packed Main Street with crowds of fairgoers. The event was an extension of work undertaken early in the Civil War by women from the west side of the Milwaukee River who belonged to an organization eventually called the West Side Soldiers’ Aid Society. The group affiliated with the Wisconsin Soldiers’ Aid Society, which operated under the auspices of the United States Sanitary Commission to provide goods and aid for Union soldiers. By early 1864 the women had shifted their focus to caring for veterans passing through the city on their way home from the war. Neither state nor national agencies provided for these men. Once the women recognized the need they broke their affiliations with the state and national groups and began to devote their energies to the new challenges. They rented storefront space on Water Street, gathered furniture, appointed matrons to oversee the care of the men, and opened a temporary soldiers’ home. The “Lady Managers” of the home, led by Fanny Buttrick, and Lydia Hewitt, regularly met to oversee the business of the home. Since some of the men needed long-term care and housing, the women set out to raise funds to create a permanent veterans’ home. Their plan called for support to come throughout Wisconsin, so they organized a great state fair to be held in Milwaukee. The wooden fair building, 300 feet long by over 100 feet wide, was constructed of donated building materials. The women traveled throughout the state soliciting help from civic, religious, educational, and social groups, collecting goods to be displayed and sold in booths located along the sides of the central hall and on galleries above the main floor. The fair had something for everyone. A dining hall seated 1,500 people at a time with meals cooked by local women. Visitors could buy tickets for a chance to own the latest in modern technology, get information about the best crops and tools, and see the output of various educational institutions. School children helped to support the effort by contributing work they completed in school or donating money raised through the sale of fair “shares.” Concerts were held under the auspices of the musical department. Trophies of the war were displayed and at a special exhibit patriotic citizens could visit “Old Abe,” the bald eagle who accompanied the Eighth Wisconsin Infantry to the war front. A few lucky individuals won feathers that fell from his tail. Others could purchase a card with a photograph of the bird on it. The result of these efforts provided more than $100,000, enough for the women to purchase land at the edge of the city, raise the first buildings, and open the doors to a permanent home for disabled soldiers. The first of its kind, ownership of the home was transferred to the National Asylum (later Home) for Disabled Volunteer Soldiers. It stands today at the Clement Zablocki VA Medical Center. ^ Frank Abiel Flower, History of Milwaukee, Wisconsin (Chicago: Western Historical Co., 1881), 740-47; Milwaukee Daily Sentinel, November 6, 1861 and November 21, 1861; Howard Louis Conard, ed., History of Milwaukee County (Chicago: American Biographical Publishing Co., c. 1895), 265-66; John H. Gregory, History of Milwaukee (Chicago: The S.J. Clarke Publishing Company, 1931), 1036, and Margaret Ann Mott, “Lydia Ely Hewitt and the Soldiers’ Home,” Historical Messenger of the Milwaukee County Historical Society 22 (September 1966): 102. ^ Ethel Alice Hurn, Wisconsin Women in the War between the States (Madison: Wisconsin History Commission, 1911), 161-65; and Milwaukee Sentinel, March 9, 1864. ^ Milwaukee Sentinel, February 17, 1865, January 12, 1866, April 14, 1864, and June 6, 1865. ^ The Home Fair Journal, Milwaukee Soldiers’ Home Fair, June, 1865, Milwaukee County Historical Society, Milwaukee, Wisconsin. See also Hurn, Wisconsin Women in the War between the States,169-74. ^ Berlin Green Lake Spectator, June 21, 1865; Dodgeville Chronicle, July 19, 1865; and Milwaukee Sentinel, March 7, 1866 and March 13, 1866. Ethel Alice Hurn. Wisconsin Women in the War between the States. Madison: Wisconsin Historical Society Press, 2013; originally published 1911. Edwin Bentlee Quiner. The Military History of Wisconsin: A Record of the Civil War Military Patriotism of the State in the War for the Union. Chicago: Clarke & Co., 1866. Sarah Edwards Henshaw. Our Branch and Its Tributaries. Thomas Gale, 1868.